"Arms race" might seem like too dire a phrase for what's essentially an egg-dying contest. But for the two bird species hurrying to outwit each other, it really is a matter of survival. The stakes in this colorful competition are so high, in fact, that they drive evolution at a pace that's rarely seen. The two birds in question reside in Zambia. One is the tawny-flanked prinia, a petite warbler. The other is the cuckoo finch, a species that's not a cuckoo at all but shares a habit with that family of birds. 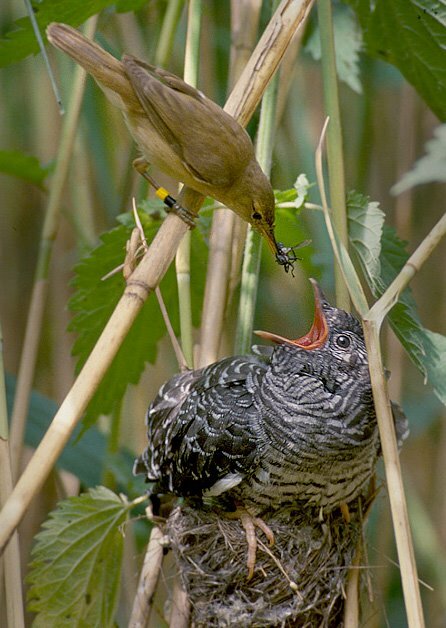 Some cuckoos are known for sneaking their own eggs into other birds' nests for their unwitting adoption, a tactic called brood parasitism. The cuckoo finch is a brood parasite too. Its target: the prinia. How difficult it is for an interloping bird to drop off its egg for permanent babysitting depends on its host. Some brood parasites leave giant, obviously mismatched eggs in other birds' nests. Their only precaution is to toss one of the host bird's eggs away in exchange. The hosts, perhaps not bright enough to notice the difference, tend the egg and eventually feed the oversized baby bird alongside (or instead of) their own. Cuckoo finches, in turn, lay eggs in a variety of colors and patterns similar to the prinia's. They have to spread these eggs around and rely on the odds that at least some of them will match their borrowed nests. This is the only way for their offspring to survive. Claire N. Spottiswoode and Martin Stevens at the University of Cambridge asked whether competition between the tawny-flanked prinia and its parasite has created an evolutionary arms race. In each generation, prinias with unusual-looking eggs should be better able to avoid brood parasitism. And only cuckoo finches that can make new eggs to match will reproduce. The researchers gathered eggs from both species in the wild. They also studied preserved eggs from a museum, which had been collected 20 to 30 years earlier. Using spectrophotometry and computer modeling, they analyzed how egg colors and patterns had changed over the decades--not just to human eyes, but as a bird would see them. 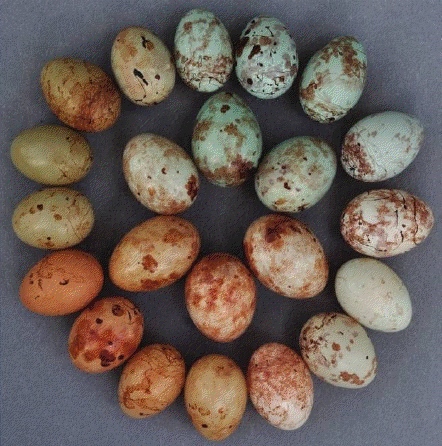 Cuckoo finch eggs from the past are a better color match to prinia eggs from the past, and cuckoo finch eggs from the present day match modern prinia eggs. This tells us the color shift over the past few decades was almost certainly not random. Instead, the two species are evolving in response to each other at an amazingly brisk pace. The color shift hasn't just been in one direction, though. Both host and parasite eggs have become significantly more varied over the past 30 or so years, as if each species expanded the Crayola box it was working with. But there's no way the birds could have kept up this expansion over thousands or millions of years of evolutionary history. They would quickly run out of colors. The authors speculate that instead, the two species are locked in an unending cycle. First the color palette expands, as is happening today. Host birds with bigger Crayola boxes have an advantage at escaping parasites, and parasites develop more egg colors to keep up. But once colors get sufficiently wild, host birds that lay average-colored eggs have more of an advantage. When all the parasitic birds are laying eggs at the edges of the color spectrum, they can't match host eggs that are in the center of that spectrum. As the cuckoo finch catches up and starts laying boring-colored eggs of its own, extreme colors once again become beneficial for the prinia, and the cycle starts over. In another few decades, maybe the prinia and cuckoo finch will be narrowing their palettes again. Forget fossil records: A cold war between host and parasite can drive evolution that's fast enough for us to watch in real time. Images: Egg rainbow, Spottiswoode and Stevens. Brood parasitism by a cuckoo, Per Harald Olsen/Wikimedia Commons.